World War I wasn't called a “World War” for nothing, and had battles spread across multiple countries and in a wide variety of locations. In the Middle East, Allied forces battled the Ottoman Empire in the Sinai Campaign for control of the Suez Canal. This served as the inspiration for Sinai Desert, one of the biggest Conquest levels in Battlefield 1 – and the map you’ll be playing in the beta next week. Sinai Desert offers a diverse gameplay experience that takes advantage of all of the elements that make World War I a perfect setting for a Battlefield game. You'll ride full speed on horseback across huge desert areas and hunt for enemies in narrow streets and alleys. You'll have shootouts from windows and rooftops in tightly contested locations where Capture points are a little too close for comfort. You'll wrestle over the skies with fighter planes or crush through the buildings with heavy tanks. It's the clash of eras and technologies all wrapped into one hectic conflict, mixed together with classic Battlefield gameplay. When one side needs a boost, an Armored Train Behemoth will be spawned in order to up the challenge for the stronger team. The train offers a range of weapons and can make a huge difference if used effectively. This means the opposing team will need to adjust to the new presence. Bomber planes are pretty effective if their pilots' aim stays true, though the train is also susceptible to a surprise attack by an organized group on horseback armed with anti-vehicle grenades. But as you might expect, the Armored Train won’t go down without a fight. The map also offers different weather than many of the others, including the occasional sandstorm that wreaks havoc on visibility and the gameplay dynamics. Strong winds blowing up sand is bad news for snipers and planes alike, though skilled pilots may be able to take advantage of the chaos. 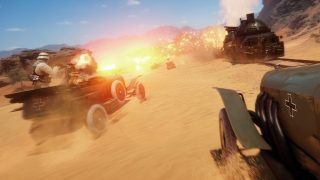 Things like these sandstorms and the variety of locations makes sure you can have just as fun with any of the infantry classes as you can with vehicles, and create a great variation of intensity throughout the map. And while there's a ton to do on the ground, there's just as much going on in the skies. One of the flags can be even taken by plane if you have the skills to safely fly inside the capture zone - you'll want to make sure to disable the Anti-Aircraft on the ground first, though, as someone could be lurking around on the ground just waiting for you to fly in. If you're more interested in dogfights, there's plenty of interesting opportunities for that, too. Some of us at DICE have gotten pretty good at ditching would-be attackers by flying through the canyon without crashing. It's tense, but provides the type of Only in Battlefield moments we know you love. 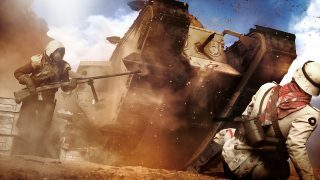 You'll experience Sinai Desert for yourself when you play the Battlefield 1 Beta on August 31. We can't wait to hear your feedback, see your awesome gameplay clips, and reveal more as we approach the release of Battlefield 1 on October 21 (or October 18 if you buy the Early Enlister Digital Deluxe Edition). Welcome to the Quality of Life Update for Battlefield 1. We’re thrilled to share some great improvements that will make it even better playing Battlefield 1.